Local representatives said the [agreed-upon changes to the voter ID law are] fine for a quick fix, but they fully expect to revisit the issue next session. The proposed Texas changes would require registered voters who don’t have one of the seven forms of suitable ID, in addition to signing an affidavit, to present either a birth certificate, utility bill, bank statement, paycheck or a government document. Under the Texas law, election officials would be prohibited from questioning a voter’s inability to obtain an ID. Officials with the Lubbock County Elections Office are saying they’re awaiting direction from state officials on how now to proceed in upcoming elections. Sen. Charles Perry, R-Lubbock, who co-authored the ID law, said it’s a fix for November, but it’s not the solution the state will be content with going forward, saying it will be addressed next session. He said hopefully the threat of the affidavits being audited for the penalty of perjury will be a deterrent for false voters, and he said those affidavits actually being audited will be key to this fix. He told A-J Media he’s confident state officials in the next session will craft legislation in compliance with the court’s filings to both meet constitutional requirements and protect the integrity of the ballot box. Rep. John Frullo, R-Lubbock, said there are already penalties in place for someone trying to cheat the system, so his thought is that being forced to sign another piece of paper — the affidavit — isn’t really accomplishing much. He said these new forms of presentable ID don’t go through the same rigor as the seven acceptable forms passed, which is why they weren’t included in the first place. See here, here, and here for the background. If the Republicans are serious about “fixing” the voter ID law, there are two basic things they can do: Allow for a larger set of acceptable forms of ID, and provide more places for people who lack ID to get a state-provided election ID card. The reason why the law was so often described with words like “harsh” and “strict” was the list of allowable IDs, which was not only minimalist but also crassly political; there’s no objective reason why concealed handgun licenses were acceptable, but student IDs and out-of-state drivers’ licenses weren’t. A more realistic list of acceptable IDs, one for which the roster of people who lack any of them was drastically smaller, would go a long way. People who have been faithfully voting their whole adult lives should not suddenly be unable to do so because they don’t drive or carry a handgun. Point two is that you shouldn’t have to travel a long distance to acquire an acceptable form of ID. Let’s not forget, the passage of the voter ID law, which stipulated that state-provided election ID cards could only be gotten at DPS offices, came in the same session where multiple DPS offices were closed due to budget shortages. A simple fix here would be to allow people to apply for election ID cards at any county government building, with the state covering any costs incurred by counties for providing that service. I can’t even think of a good argument against that. 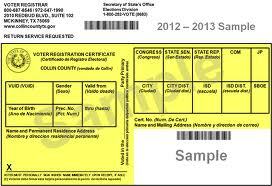 Now to be sure, even if the Lege does what I suggest, I still oppose voter ID. I believe voting should be treated as a right that every 18-years-and-older citizen has, which can only be taken away under limited circumstances, and I will continue to advocate for that. In the meantime, though, this will deal with the main objections to Texas’ voter ID law, and will at least restore things to roughly what they were before the law passed in 2011. I’ll take that for now. In working the 2013 elections, it was evident to me that there were as many interpretations on how to use the actual ID as there were election clerks. The letter of the law stipulates that it is to be used for address comparison. Yet many workers will do their best liquor store ID-check routine in comparing the picture to a person’s face (and the law does not require the photo to resemble the person standing before you). I’d be shocked if there is any evidence that this has gotten better. As for the law itself, it would be a worthwhile step to see the majority party offer either automatic registration for people with a DL or ID … or at least offer some amount of same-day registration if we’re in the business of establishing that we know for 100% certainty that the person with the ID is who they should be. Of course, both of those are assuming that said party is interested in maximizing the possibility of legitimate voters actually casting votes. Blocking minority and young voters from casting ballots is in the DNA of conservatives, and will be the basic strategy moving forward. Conservative whites will always try to find ways to keep “those people” from voting them out of power. A small pick, Kuff, about using an out of state DL as identification to vote in Texas. When you move to Texas, you only have a certain amount of time to get a Texas DL. The fact that someone has not gotten a Texas DL or ID card, and still retains the card from their old state tells me they aren’t committed to being a Texas resident, and thus, should vote in the state they came from.